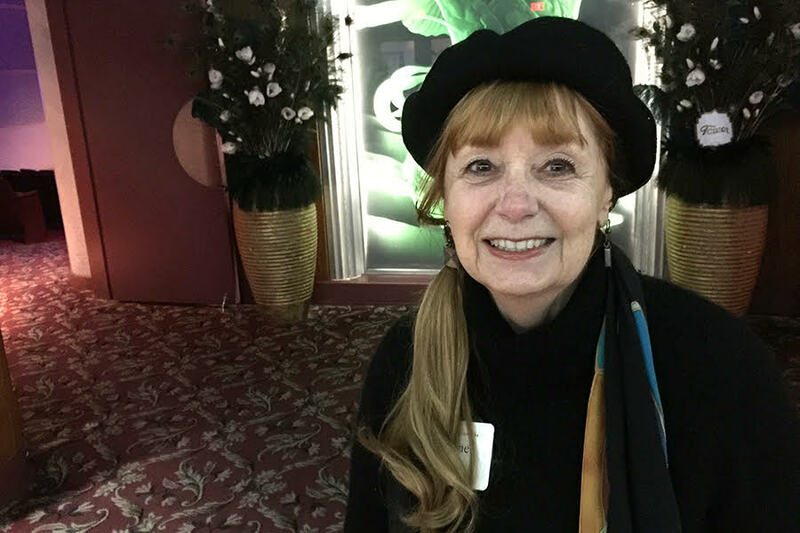 When our latest volunteer in the spotlight, Suzanne Watkins, isn’t making popcorn for Filmworks, she teaches art and design. Occupation: Suzanne is a teacher, artist, interior designer, and traveler. She is a professor living in Fresno teaching three classes, one at the University of Phoenix — where, she says, she’s the entire “Art Department” — and two online courses at the Rocky Mountain College of Art+Design in Denver. Before moving back to Fresno in 2013, Suzanne lived off and on in Hawaii for 30 years, and she served as the former chair of the fine arts department at Chaminade University of Honolulu, focusing on fine art, art history, and interior architecture and design. In Hawaii, she also had a successful design practice in high-end sustainable residential design, resort design, and preservation design for more than 25 years. Art is a passion for Suzanne. She specializes in watercolor on paper, dye on silk, collage, and lately assemblage and sculptural pieces. Suzanne doesn’t stop moving. In her free time, she is renovating a Tower District bungalow, using her interior design knowledge to make the space hers by her own hands. Suzanne loves to introduce her students to films or theater opportunities they might not have seen before, like “Singing in the Rain”. How did you get started with Filmworks? What is your typical volunteer job, and what do you like most about it? What’s the most unusual volunteer experience you’ve had with Filmworks? What’s your favorite film that you’ve seen with Filmworks at the Tower Theatre? What other types of films or genres would you enjoy seeing at Filmworks? What movies do you want to see that are in theaters currently or coming soon? Back in Hawaii, Suzanne says she and her friends used to go out all the time after films, getting big orders of Chinese food before finding their way back to her home. She would be up hours at a time with them, she said, discussing the movies. Admittance to these celebrations: a bottle of wine at the door to share for all. What’s your favorite thing about Filmworks? Suzanne says she loves the experience and aesthetics of the historic Tower Theatre. Even though she says her volunteer part may be small, she loves the entire experience, helping out any way that she can. Of course, there’s the obvious pleasure of seeing the films too, she says. Hazel Antaramian-Hofman, Frank Dougherty, Richard Flores, Trin Gibney, Megan Ginise, Satch Gonzales, Neal Howard, Andy Julian, Richard Markley, Monica Marks, Steve Ohanesian, Luis Ojeda, Gene Richards, Justin Secor, Sky Sweet, Jon Veinberg, Suzanne Watkins. To meet our past volunteers in the spotlight, and to find out how you can volunteer with Filmworks, visit our volunteer page.